Ensure your workplace is secure with this Photo ID Name Badge. Add up to 2 lines of text and easily upload your image to this ID badge! Hand crafted in the USA, this Photo ID Card Name Badge is completely made to your individual specifications. 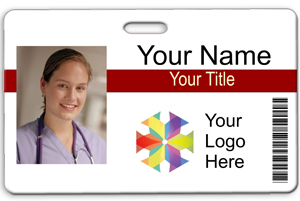 Perfect for your staff, this ID badge is produced on high-quality PVC plastic and printed with full color. The Photo ID Card template features your photo on the left side with your logo image and bar code on the right. Double sided ID option is also available. Ensure office or school security with this Photo ID Card Name Badge. Order now!